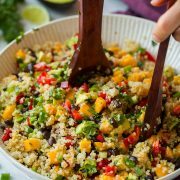 You can never have too many side dish recipes, especially when they are as colorful and nutritious as this one! This Three Bean Salad is the perfect side dish to poultry and fish, and with its blend of colors it’s perfectly festive for the season at hand. It would be a a fun twist to serve up this healthy bean salad at Thanksgiving instead of the same old green bean casserole. I love all the bright flavors and the burst of freshness in this salad. I also love that it’s something out of the norm from the classic lettuce loaded salads. 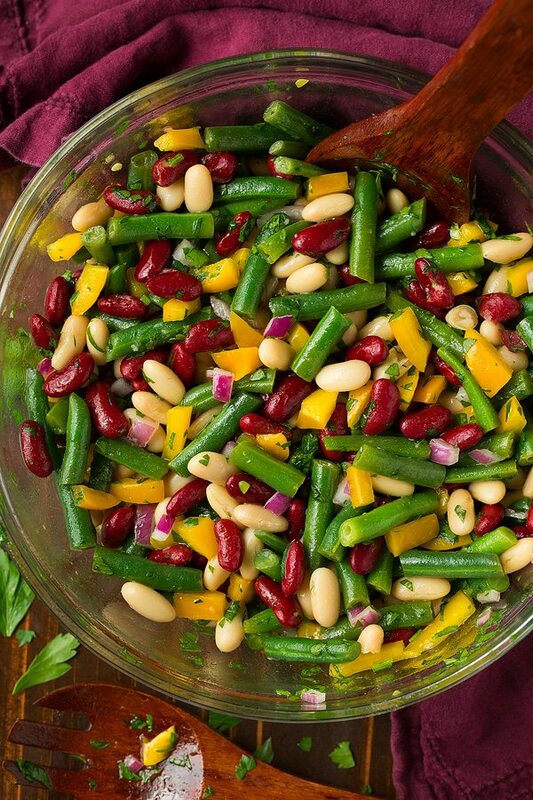 It still has a delicious vinaigrette, but instead of tossing that over greens and the classic tomatoes, cucumbers, etc it’s tossed over a mixture of fresh green beans, two types of kidney beans, bell pepper and a fair amount of red onion. The great thing about this side dish — beyond it’s wonderful flavor — is that it’s perfectly hearty thanks to the two pulses it contains (the light red and dark red kidney beans). What exactly is a pulse? You may be asking. Pulses are any of the the following food items: beans, peas, chickpeas or lentils. Pulses are so versatile, and with just a few seasonings they become so delicious. Not only are pulses so tasty, they are also a healthy, sustainable food source. I’ve taken the pulse pledge this year and so should you! When you do, you commit to eating pulses once a week for 10 weeks and join a global food movement! Eating dry peas, lentils, beans and chickpeas helps reduce your carbon footprint – and it’s great for your health. Every 1/2 cup of cooked pulses delivers 9 grams of protein. All you have to do is visit PulsePledge.com and sign up! 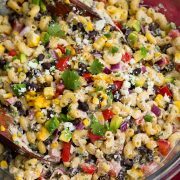 Add this three bean salad to your menu soon! Everyone will love it! Whisk together olive oil, vinegar, honey, mustard and salt and set aside. Boil green beans for 3 – 4 minutes until tender, then drain and transfer to a bowl of ice water. 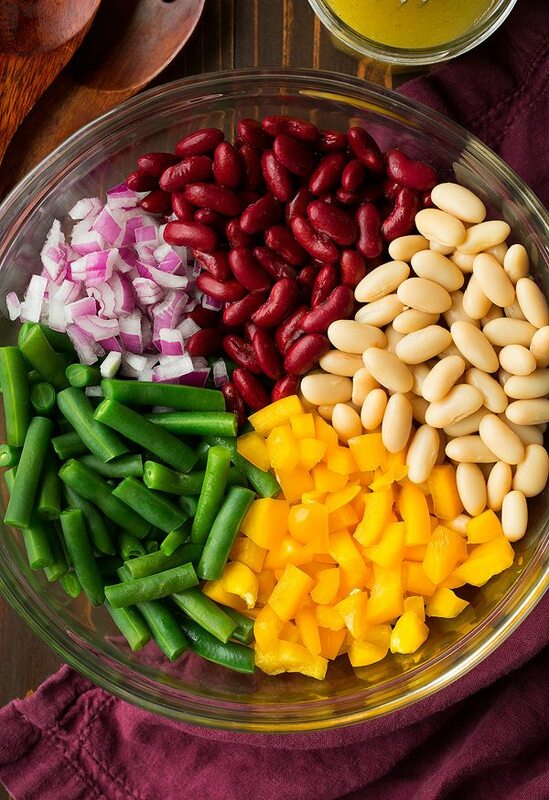 Add green beans, kidney beans, red onion, bell pepper and parsley to a salad bowl. Pour dressing over the salad mixture and toss to coat. Can I Use Different Types of Beans? Yes, you can use any three beans you like. But I think the fresh green beans really help brighten up this salad! Can This Healthy Bean Salad Be Made in Advance? Yes, you can make this three bean salad up to a day before you plan on serving it. The bell pepper may lose a bit of its crunch over time, though. Submerge the cooked green beans in ice water to prevent them from over cooking. Drain and rinse the kidney beans before mixing them into the bean salad. 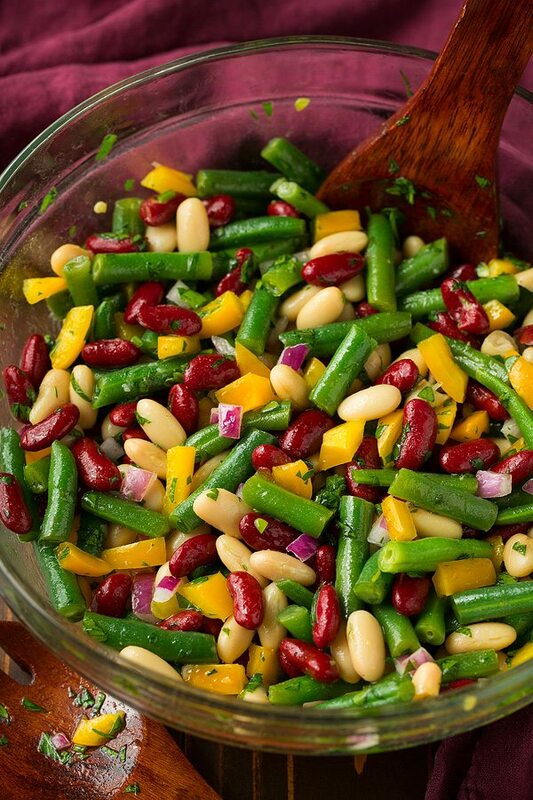 A healthy, colorful salad made with green beans and two kinds of kidney beans, bell pepper, onion and a bright dressing. 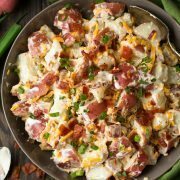 A flavorful side dish and nice change from the classic side salad. In a small mixing bowl or jar whisk together olive oil, vinegar, honey, mustard and salt, set aside. Bring a large pot of water to a boil. Meanwhile fill a medium mixing bowl with ice and water and set aside. Once water is boiling, add green beans and allow to boil about 3 - 4 minutes until tender. Drain and immediately transfer to ice water. Let rest for a few seconds then drain well. Add green beans, dark and light red kidney beans, bell pepper, red onion and parsley to a salad bowl. Whisk dressing mixture until well combined then pour over salad. Toss to evenly coat. Serve immediately.